The rail link from Napier to the hub of Palmerston North is vital to New Zealand’s rail network, and vital to the Hawkes Bay economy. Napier is used for local exports and imports are distributed nationwide. Local industries benefit from the ability of rail to be able to deliver large quantities of goods efficiently and timely. Four trains are timetabled to run across this line each week day, with up to six running if the need should arise, with an additional train running during the weekend. The terrain is diverse and may be challenging for the trains, but makes an excellent backdrop for photographers. 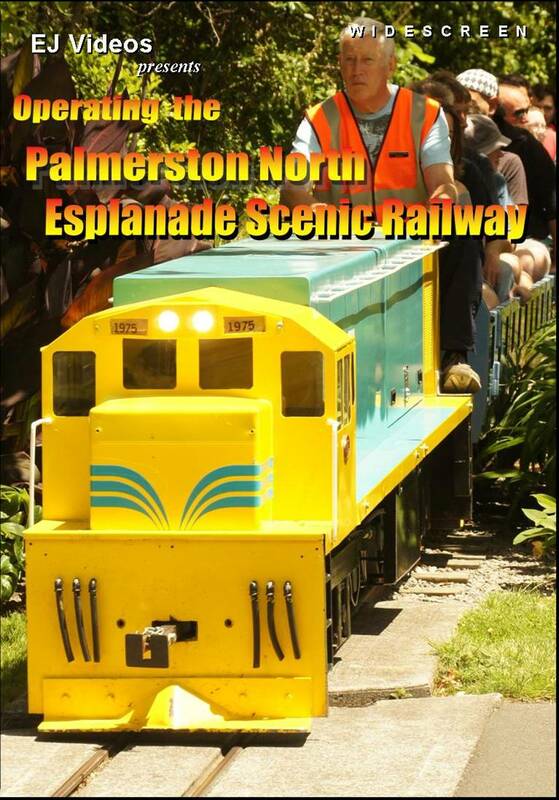 This production covers modern railroading from Napier to Palmerston North, where the focus is on freight trains, marvels of engineering and classic New Zealand scenery. In operation since 1897, the Wairarapa Line, or the ‘Y’, runs from Wellington to Woodville via Upper Hutt, Featherston, Masterton, Eketahuna and Pahiatua. Today, passenger services that run from Wellington to Masterton are a common sight each day, but beyond here to Woodville, traffic volumes are low. Roll on Christmas 2010, where for two weeks over the holiday period, freights that normally ran along the NIMT were diverted along the ‘Y’ to cater for essential track maintenance on the main trunk. This meant that up to nine freight trains a day were running on tracks that would normally see only one train a week. 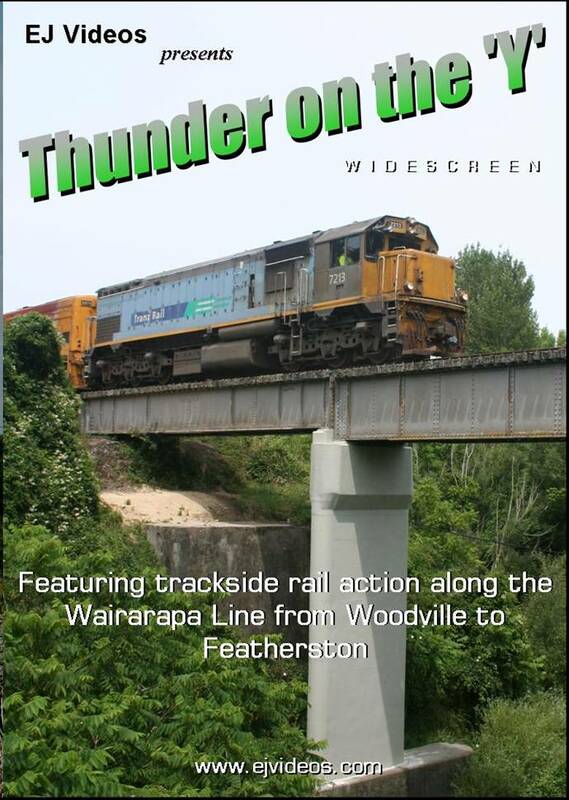 EJ Videos was on hand to capture the action, covering trackside rail action from Woodville to Featherston. Thundering through the heart of the Ruapehu District, New Zealand’s KiwiRail is tasked with the challenge of moving people and freight, north and south, 24 hours a day in all weather extremes. This production catches a small glimpse of that rail action on the North Island Main Trunk, with the action kicking off at the small settlement of Mataroa. From Mataroa we then head north to the Turangarere horse shoe curve, the Hihitahi passing loop, then on towards the desert town of Waiouru where we’re treated to a few snow scenes. We’re also treated to the pulp train being double banked – where the Karioi and Tangiwai portions are taken to Waiouru and assembled into the one train. 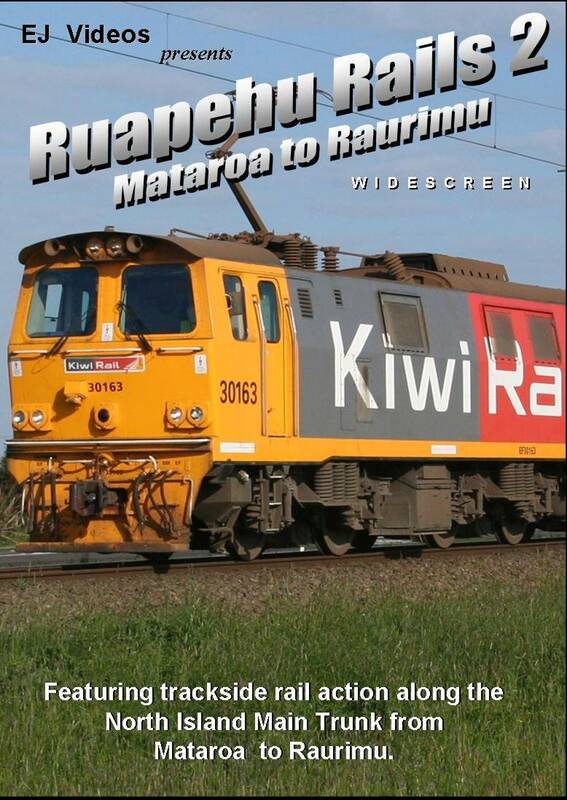 We then continue our journey via Karioi, Ohakune, Horopito and National Park, capping it off with a rail train at Raurimu.Footage is from 2009, 2010 and 2011. This program was initially made at the request of a PNESR member as a Christmas present to himself from me. He's pretty pleased with it and so am I, so I'm offering it up for everyone else as well. We take two rides on the train, one where we see the entire trackwork while the warning signs are put out, and another to get alternative shots from various angles. The rest of the program is shot from trackside from almost every vantage point available - I even managed to do a pacing shot ! Human interaction is way up there with both kids and adults playing it up for the camera - tolerable and in some cases, amusing. Note: This program is not sanctioned by the PNESR nor did they have any input into its content or creation. 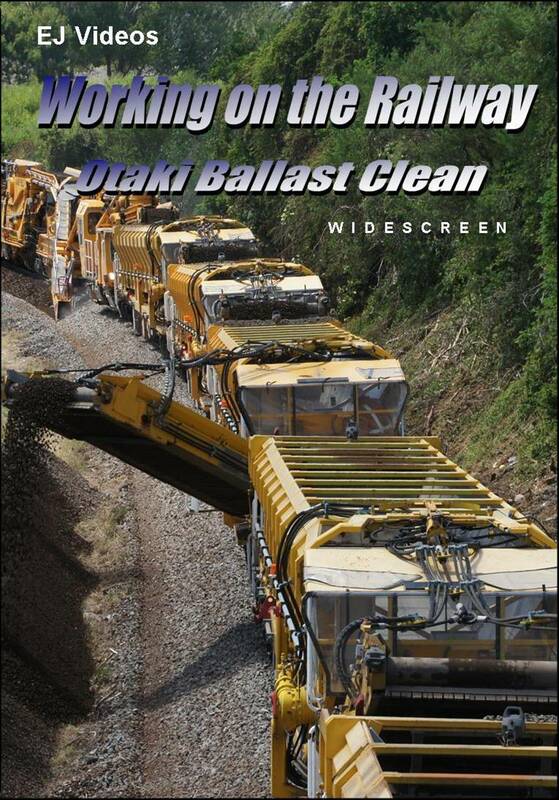 On February 12, 2012 KiwiRail's track maintenenace teams from Palmerston North embarked on a mission to run a ballast cleaning operation over a section of track on the North Island Main Trunk at Otaki. One Ballast Cleaner, six Conveyor Wagons, one Tamper, one Regulator, one Stabilizer, one DC Locomotive, four support wagons, excavators, dump trucks and all the manpower necessary to achieve the task. As soon as the last train went through – the northbound Overlander - the crews sprung into action. Soon after the air was heavy with the sound of ballast being moved un der huge mechanical force. Witnessing all this machinery in action is a rare treat, and to time it with a pleasant Sunday afternoon from many vantage points was an added bonus. This program shows all the equipment in use, how it works and how each has an important role to play. Multiple angles provide rare glimpses of this machinery in motion. 60 minutes. Nothing quite demonstrates the power of trains like being right beside one of these machines of steel when it’s hurtling along the tracks with 1000 tonnes of freight. The senses are overwhelmed with sound, smell and sight and many motorists will wind down the car window to savour the riotous racket. The next best thing to being there is to capture all of this action on video. 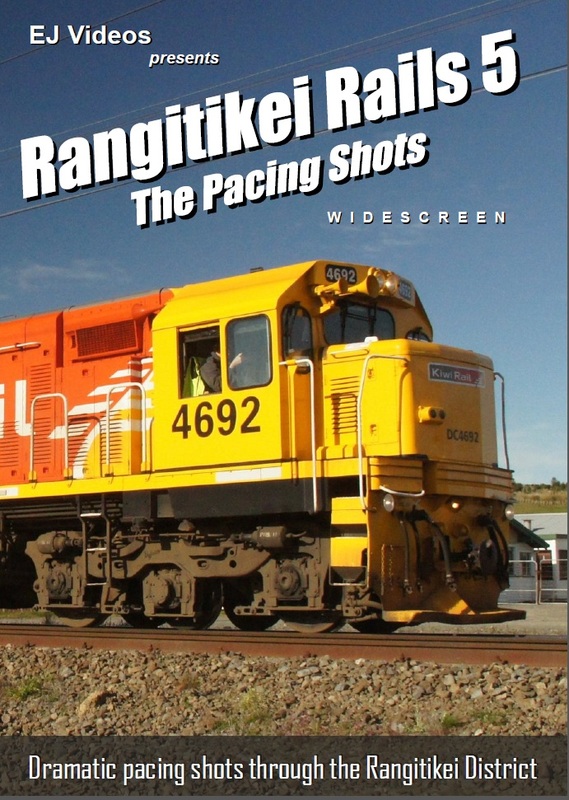 Though the combination of years of practice, constantly refining the camera setup, good timing and on many occasions, good luck, EJ Videos is pleased to present this very loud, very dramatic compilation of pacing shots from the Rangitikei District. We capture diesel, electric and steam hauled trains right up close and personal, soaking up the sounds of steel wheels on steel rails, blasting airhorns, reverberating diesels and not to mention the unmistakable audio symphony that only a steam loco can produce. Our journey takes us from Taihape to Bunnythorpe, through rolling hills and open plains, from the brightest sunlight to the ugliest of wet weather. Through the use of an Active Image Stabilization lens and a customized camera mount, the action presented is surprisingly smooth, even when the road isn’t. KiwiRail’s Main North Line from Christchurch to Picton is an illustration in contrasts. Starting out from Middleton Yard heading north, the line soon rolls out from the suburbs of Christchurch into the mid Canterbury plains where flat land allows for straight tracks and high speed running. Following the banks of the Conway river, the line reaches the east coast at Claverly which it then follows through a series of tight curves and tunnels to Kaikoura and beyond to Clarence, finally heading inland again at the Waima River. 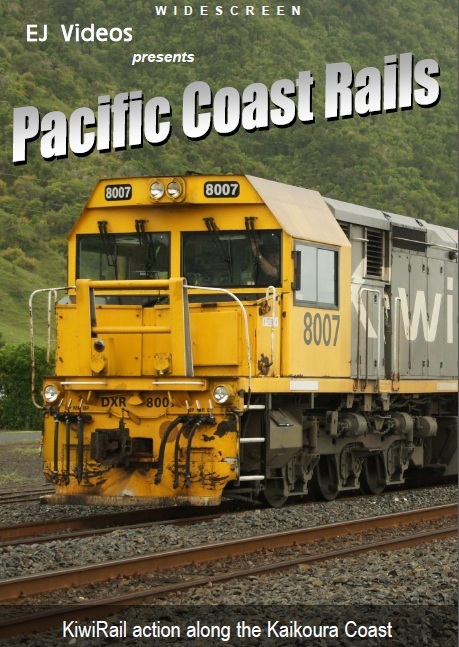 Its close proximity to the South Pacific Ocean has been a drawcard for tourists riding KiwiRails Coastal Pacific, a daily passenger return service that takes just over 5 hours per leg. From Waima the line twists through a series of valleys to Ward and Seddon, negotiating a climb up to Dashwood and downhill again to Lake Grassmere, Blenheim and finally Picton. 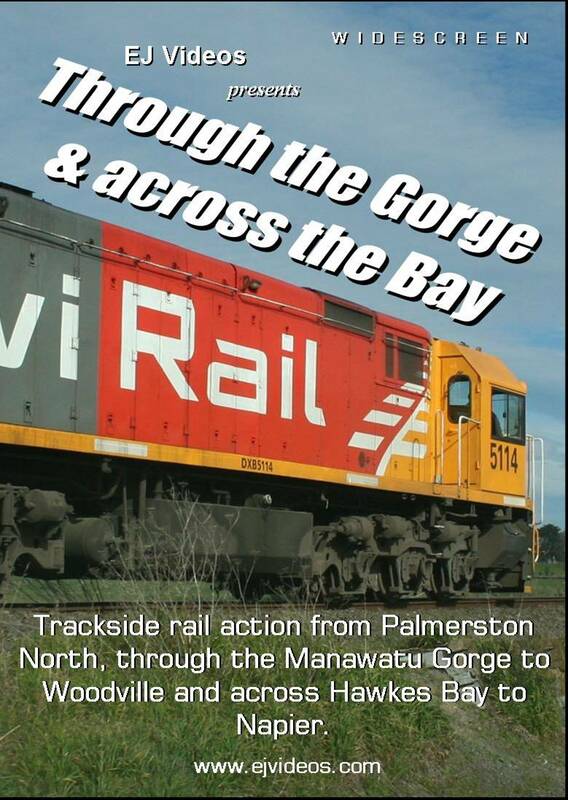 This production covers rail action from Picton to Orao and encompasses both freight and passenger trains filmed at well-known geographic locations and landmarks, familiar to both railfans and motorists. Mainline Steam’s Ja1240 also makes a few appearances as it heads south for the Rail 150 celebrations at Christchurch.